Before moving to Phoenix, a high school drafting class was the only formal art training that Jordre had ever taken. His background is in primary education, a career he pursued for nearly a decade, teaching fifth and sixth grade social studies in a middle school in Egan, MN, a Minneapolis suburb. Needing a shift in perspective, he took some time off and moved to San Diego, then headed to San Francisco after landing a job as a corporate trainer for a Silicon Valley high-tech firm. After a few years in this field, including a brief stint in North Carolina, Jordre remained restless. It wasn’t until he was renovating his North Carolina home in 2005 that Jordre stumbled upon painting. 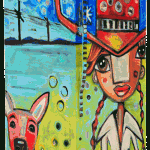 Needing a piece of art to fill a blank wall in his home, he picked up a canvas from a craft store, filled two plastic condiment bottles with paint and started splattering away. His hands ached for weeks afterward. But, it was worth the temporary pain, as it launched his career as an artist. The original piece now hangs in his parents’ home. Jordre Studio. Photograph courtesy of Kyle Jordre. Jordre moved to Phoenix in the spring of 2006. He had visited on several occasions, and enjoyed the culture of First Friday art walks. While looking for houses, on a whim, Jordre asked his real estate agent if there were any art studios on the market. The agent showed him a small vintage building on Grand Avenue. Jordre knew immediately that this former grocery store-turned-art gallery was the right space, and Jordre Studio was born. Since then, Jordre has progressed from creating art with condiment bottles to other kitchen implements such as wooden spoons, spatulas and serving forks. One tool he has never used, however, is a paint brush. Jordre uses his unconventional implements as a way to get a lot of paint on a canvas quickly, as he says doesn’t have a lot of patience and wants to see his work come to life in front of him. As a rule, Jordre doesn’t name his paintings, nor sign them to indicate orientation. He “wants people to look at the art and react for themselves.” Leaving paintings unnamed allows for people to be drawn in and find their own meaning. Jordre feels this encourages dialogue, and ultimately broadens the meaning of his work over time. One benefit of being new to the art scene was that Jordre had no had no clue about how difficult it is to sell art. “If I did,” Jordre comments, “I would never have started.” He estimates that it takes at least 1,000 people viewing a piece of art to find the right buyer. That’s a lot of eyeballs. To attract them, Jordre participates in First Friday art walks, holds several shows each year and uses the Web and social media to market his work. Another unique aspect of Jordre’s art is its sustainability. He makes every effort to reuse and repurpose materials in his work. 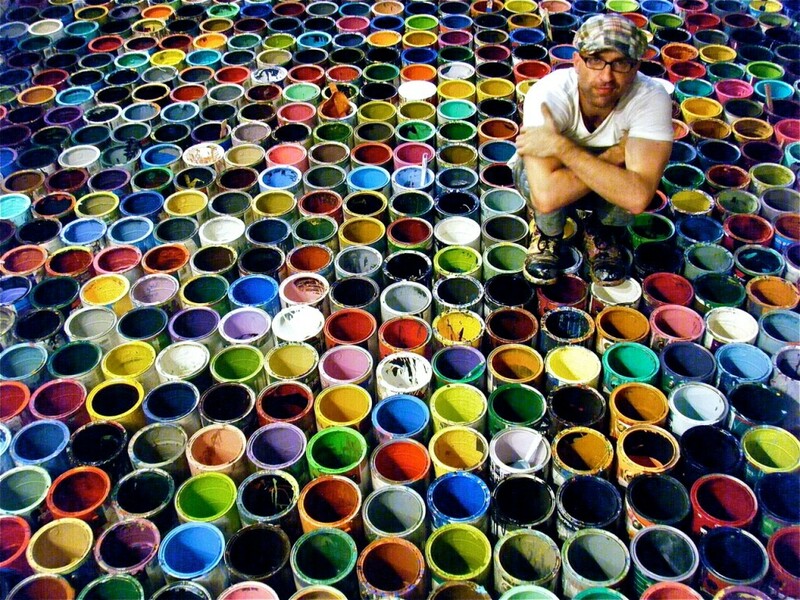 All the paint he uses comes from the “oops” section in local paint and hardware stores. 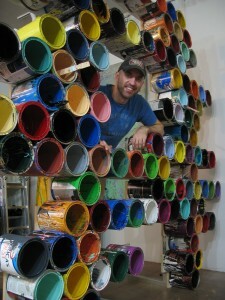 He also reuses the paint cans, turning them into sculptures, furniture or room dividers. An upcoming show, opening November 14 at the Sunrise Mountain Library in Peoria, highlights his dedication to the environment by asking, “What color is green?” He is promoting it using cut-up pieces of some of his paintings. A self-declared introvert, Jordre has nonetheless channeled the educator in him to reach out and interact with his community. He says that as an artist, you need to take part in the a community to survive. To this end, Jordre views his gallery space as a community resource for others. Not only does he open his gallery on First Fridays, but he also allows other artists to use it for openings and receptions. 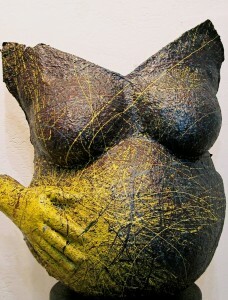 Phoenix Birthing Project. Photograph courtesy of Kyle Jordre. Jordre also uses his studio space to hold small workshops and retreats for friends, other artists and other small groups. During these sessions, Jordre talks about his work, how he creates it and his “no rule” approach. He then turns the participants loose with stir sticks, grilling forks, squeegees, spatulas and power drills on large group-sized and smaller personal canvases. Jordre enjoys these sessions, as they combine his education and facilitation background with his passion for painting. He has had great feedback from participants as well. Even the most reticent people end up enjoying these events, channeling their inner artists. In addition, Jordre has donated several pieces of his art to local fundraising efforts. Some highlights include a 2007 Free Arts of Arizona ‘Chair’-ty Fundraiser, the “Diner in the Stacks” 2007 fundraiser for the Phoenix Public Library Association at the at Burton Barr Library, a “belly cast” to benefit the Phoenix Birthing Project and a Twestival fundraiser earlier this fall benefiting St. Mary’s Foodbank. This fall, Jordre will participate in two charitable projects: The Mannequin is our Muse Design Competition at the newly opened Barney’s in Scottsdale benefiting the Scottsdale Museum of Contemporary Art, and the All Decks on Hand auction at After Hours Creative benefiting the Southwest Autism Research & Resource Center. Jordre’s dedication to his community has begun to pay off. Recently, the city of Peoria purchased one of his paintings (and a pair of boots he wore while creating it). The painting (#117) now hangs immediate inside the newly opened Sunrise Public Library, and is the centerpiece of the building. A short video of the painting’s creation is available for viewing here. Next year, some of his work will appear in the Glendale Public Library. Jordre is glad that he is part of Grand Avenue. He enjoys the energy and vitality that is building along the street. He also enjoys the fact that people are able to do their own thing, whether it be painting, other forms of arts or the many crafts-related galleries and stores that are popping up. As for the future of the street, he would love to see it live up to its full potential and is looking forward to its continued evolution. He admits that such an evolution is dismaying to some — noting that emotions and business don’t always mix. 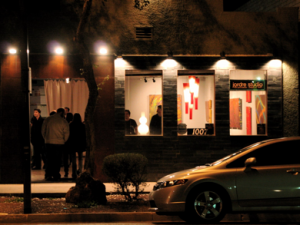 Nevertheless, Jordre asserts that like art itself, a successful arts district can’t be static; it needs to adapt to changing times and demographics. The challenge is finding appropriate ways of doing so, namely through encouraging small businesses, artists and entrepreneurs who can connect with a community in a way that larger business cannot. Jordre Studio is located at 1007 Grand Ave. To schedule a studio visit, or for further inquiry, contact Kyle by email or by calling 602.254.6303. Great article, Yuri. I’ve seen Kyle’s work and talked to him briefly at Twestival, but what you’ve posted here gives me a much deeper appreciation. Thanks David. This is what I hope to achieve in my posts. I want to give readers a greater appreciation of the people and places that are (re)creating downtown into a vital urban place. Thank You for writting this article, I have never meet Kyle, I’m glad to understand what he does for Phx. To be honest before reading this I had a biased opinion on his work, I felt it was too similiar to a Jackson Pollack peice, and i didnt really get why Jordre’s work is being praised. Now I see it’s much more than the final out come of the peice, but more of the process that is key.